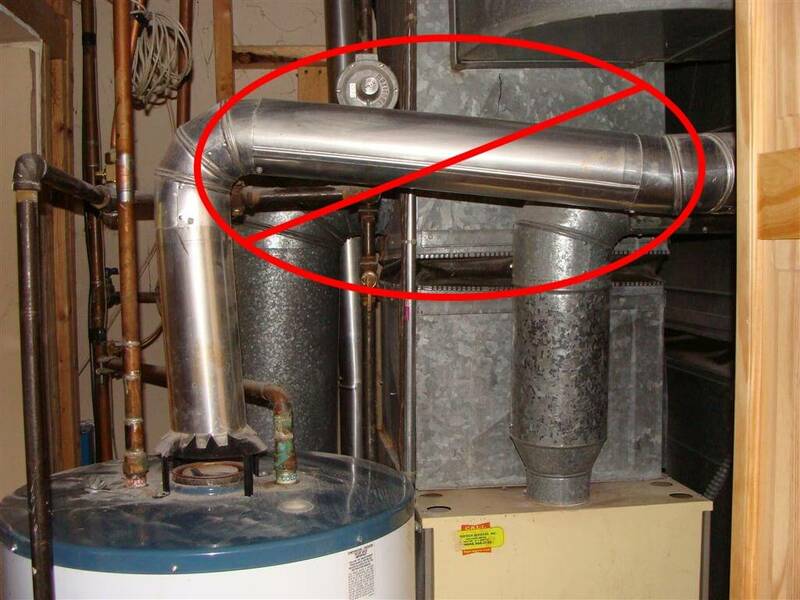 If a water heater backdrafts, it means that potentially hazardous exhaust gases are coming back into the home. 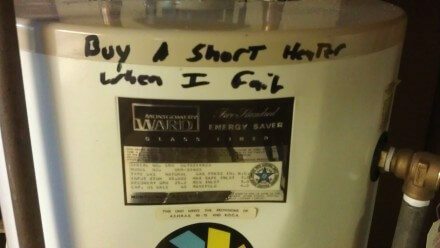 Last week I blogged about how to determine if a water heater is backdrafting; that’s the easy part. The tough part is determining why it’s happening and fixing it. There are many potential causes for a water heater to backdraft, so I’ll cover as many as I can think of. In many cases, it’s a combination of conditions. The one guaranteed fix for all of the issues that I’m going to discuss is to install a new powervent water heater that typically vents through the side of the house. Powervent water heaters won’t backdraft, but they cost more money, they’re more work to install, there’s more that can go wrong with them, and they won’t operate if the power goes out. A vent connector is the thing that takes the exhaust gases from the top of the water heater (draft hood) to the vent. 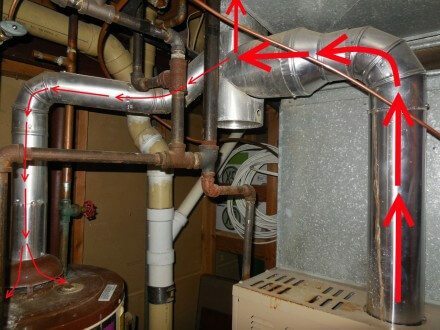 If a vent connector isn’t properly installed, the potential for the water heater to backdraft increases. One of the most common installation defects with a vent connector is improper pitch; the vent connector need to pitch upwards towards the vent with a minimum slope of 1/4″ per foot, and there should be no sags or dips. Insufficient rise in the vent connector can contribute to backdrafting. While the code requires a minimum pitch of 1/4″ per foot, if there is a quick 90 degree turn right at the top of the draft hood and the vent connector only has the minimum pitch, there’s a good chance that it won’t draft properly. There needs to be more of a rise created in the vent. Most atmospherically vented water heaters come in two shapes – tall and short. Short water heaters are a couple of inches wider and nearly a foot shorter than tall water heaters. Replacing a ‘tall’ water heater with a ‘short’ gives the vent connector almost an extra foot of rise, which will increase the potential for the water heater to draft properly. Another common defect with a vent connector is too long of a horizontal run. The longer a vent connector runs horizontally, the greater the potential that it won’t draft properly. 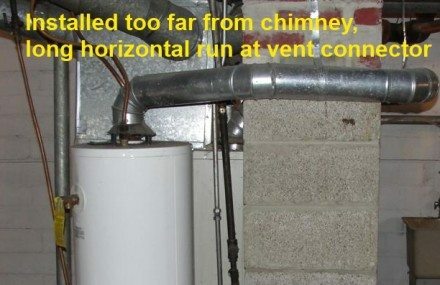 Section 503.10.9 of the Minnesota Fuel Gas Code says that “a vent connector shall be as short as practical and the appliance located as close as practical to the chimney or vent“. 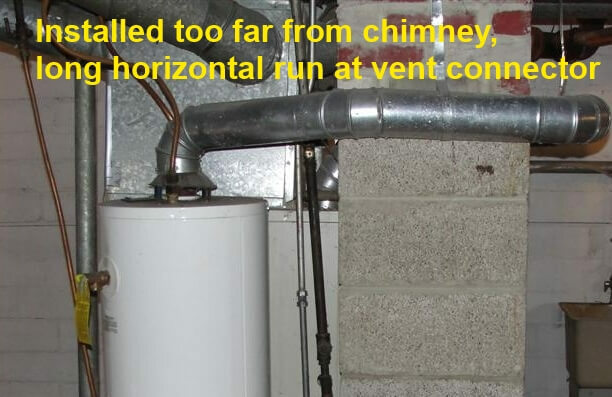 The photo above shows a water heater installed much farther away from the chimney opening than it should be. That water heater could certainly be moved closer to the chimney. Another thing that can be done to help with a long horizontal run is to replace a single-wall vent connector with a Type B vent connector. This will help the vent to heat up faster, which will help with draft. Mid-efficiency furnaces have an induced draft fan that is designed to pull the exhaust gases out of the heat exchanger for the furnace. This fan ends up ‘pushing’ the exhaust gases up the vent, and if the water heater vent connector is located directly across from where the exhaust gases are directed, the exhaust gases from the water heater get pushed right back down. Most water heaters will not draft properly with this configuration. One way to fix this is to re-arrange the common vent so the water heater vent connector is offset from the furnace. 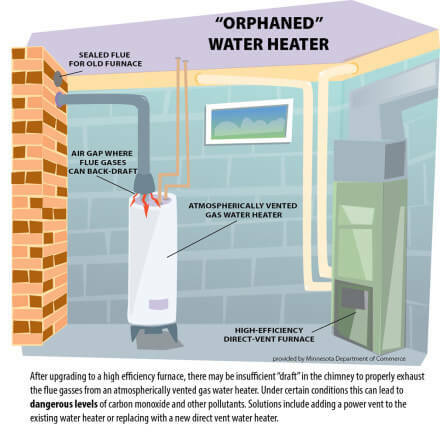 Here’s a common scenario for water heater draft problems: an old 80% efficient furnace is replaced with a new, high efficiency furnace that vents through the side of the house, leaving the water heater vent an orphan. The illustration below, provided by the Minnesota Department of Commerce, Division of Energy Resources, shows what this looks like. The relatively small burner on the water heater may not generate enough heat to warm up the chimney or vent, which can lead to backdrafting. In many cases, a new vent liner will be installed to allow the water heater to vent into a smaller space. 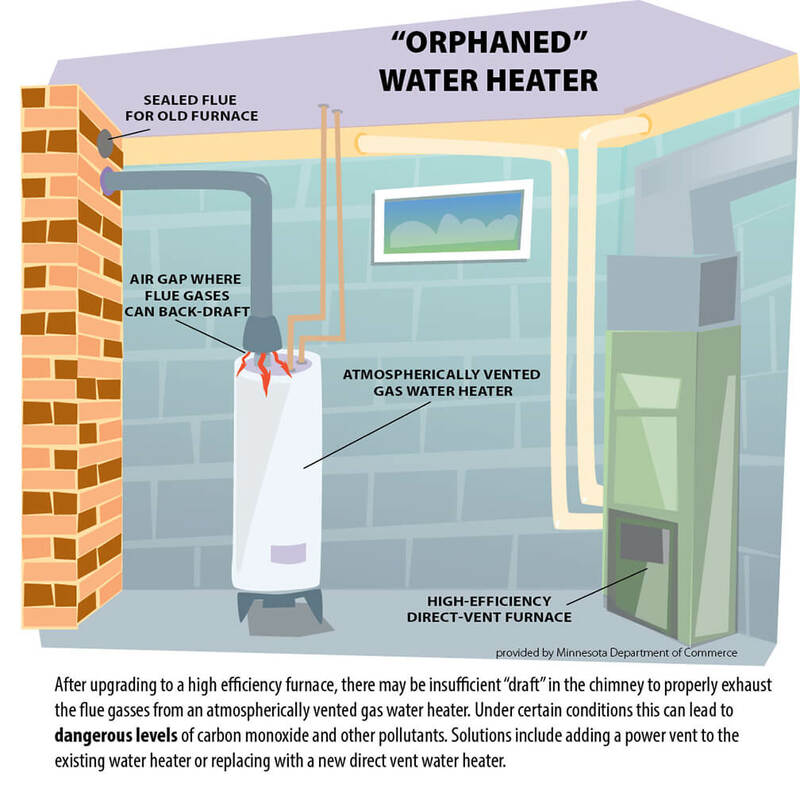 The text in the image above also mentions adding a power vent to the existing water heater. Tjernlund of White Bear Lake, MN makes such devices; one is a powervent conversion kit for an existing water heater, and another is a chimney stack assist kit for an existing water heater. An obstructed chimney or vent will almost certainly cause backdrafting. I’ve heard stories of leaves, acorns, and squirrels in chimneys and vents; I once even found a dead bird blocking the draft hood at a water heater. To help prevent the possibility of that happening, a listed cap should be installed at the vent terminal at the exterior. 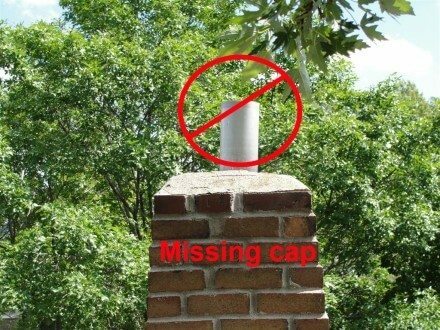 A proper cap will help to prevent debris from falling into the vent, keep rain out, prevent downdrafts caused by strong outdoor winds, and is required by the Minnesota Fuel Gas Code (section 503.6.6). For a water heater to draft properly, it needs to have plenty of available air. Some water heaters will be right on the brink of backdrafting even with a proper installation, and all it takes is a single bathroom exhaust fan to pull enough air out of the house to make the water heater backdraft. Even in a home with a water heater that drafts very well, just throw in a big 600 cfm kitchen hood fan and it’s almost a guarantee that the water heater will backdraft with the fan running. Insufficient combustion / makeup air is a condition that many plumbers and HVAC folks seem to have a tough time diagnosing. They get called out to correct a backdrafting water heater and they head right down to the basement to diagnose the problem. They see that the venting is all installed to code, there’s a nice rise in the vent connector before the chimney, there’s a combustion air duct installed, and there are no signs of previous backdrafting. They get the water heater to fire up, and it drafts perfectly for them, so they proclaim there are no problems. Hmm… did they miss any steps in testing for draft? ‘Fraid so. According to Steve Schirber of Cocoon, LLC, BPI standards for testing water heater draft are extremely similar to the steps that I listed in my blog post last week. I won’t go into all of them, but they involve closing all windows and doors, turning on exhaust fans, and only running the water heater. If a water heater backdrafts under a worst-case scenario test like this, open a few windows or a door to see what happens. If the water heater starts drafting properly right after doing that, it’s obviously a problem with insufficient combustion air or makeup air. The fix for this is to hire a savvy plumber or HVAC contractor with a holistic understanding of houses. If there is already a combustion air duct installed, they’ll make sure the intake is clean at the exterior and the duct is not obstructed. If that all looks good, they might install a makeup air duct; it’s pretty much identical to a combustion air duct. They might just guess at the size needed and do a performance test when they’re done, or they might use Minnesota Mechanical Code Section 501.3 to find a formula for the amount of makeup air needed. Some day I might follow up with a blog post attempting to explain how to use Section 501.3 to figure out a formula for makeup air. Post update: Here’s a blog post attempting to explain Section 501.3: How to determine if makeup air is required. That’s everything I can think of. Thanks very much for this post, Reuben – it’s been very helpful! Based on this information, I ordered and installed a Tjerlund Chimney Stack Assist kit, since my water heater was orphaned last year (and no sizing modifications were made to my chimney flue/vent liner). The Stack Assist kit was surprisingly easy to install, and it works like a champ. Thanks again! As part of most energy evaluations, there should also be a combustion spillage test. This involves installing the blower door, activating all exhaust fans in the home (bathroom, kitchen as well as the clothes dryer), then measuring the amount of negative pressure that creates. Typically anything over -5 kPa is a red flag. In my testing, the dryer pulls the most air.